While checking campsites this summer, the TLA’s summer staff also worked on repairing and replacing box privies (colloquially known as “thunder boxes”) that were damaged or in poor shape. Over the last three years, the TLA built about 20 new privies, and 11 of these were installed in various areas of the lake this summer. There are now brand-new privies in the far North arm (the western half past the fork), the NE arm, the South arm, the SW arm, Gibson’s Bay, Cross Bay, Kokoko Bay, and Devil Bay. New privies were also installed in 2012 and 2013 by the TLA in Sharp Rock Inlet, the NE arm, and various parts of the Hub. Gratitude is also due to Camp Wabun, who helped install several new privies around the lake in 2012. 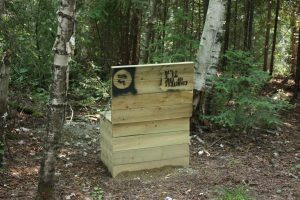 Virtually all areas of the lake were visited over the past three years and existing privies added to, up to the current total of 76 box privies spread over 150 campsites. Repairs were also made to five privies in the SW arm, NW arm, the trail to Devil Mountain, and two locations in the Hub. Privy installation and maintenance is an important way in which the TLA hopes to safeguard the water quality of Lake Temagami. We ensure that privies are well-constructed and located based on MOE recommendations for distance from shore, as well as being dug a minimum of about one metre into the soil.